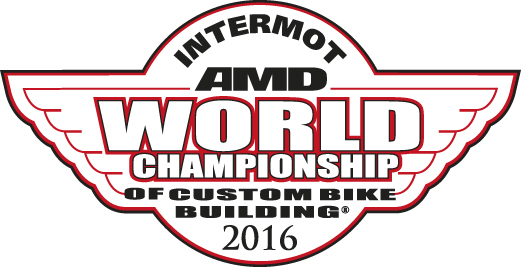 Entries for this year's AMD World Championship of Custom Bike Building opened at the beginning of February, and as at mid-March, after just seven weeks, and including our affiliate event qualifiers, there were already 46 bikes entered by 38 competitors from 13 different countries - including entries from as far afield as Israel and Japan! Following the success of the 2014 experiment of hosting the AMD World Championship at the 200,000 plus attendance INTERMOT Expo in Germany, the event is now slated to be held there in October this year (October 5 - 9), and also in 2018 and 2020. 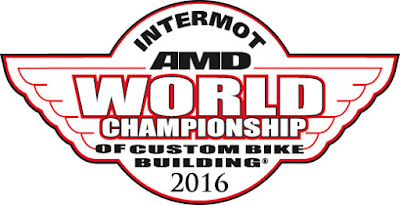 Tapping into INTERMOT's ready-made attendance achieved the aim of giving the custom motorcycle industry access to the largest possible audience of potential customers yet achieved by the AMD World Championship. The competitor community voted the 2014 experiment a success, and as a showcase to energise existing custom fans and enthuse new potential customers for the sector, the AMD World Championship's presence at INTERMOT is a "slam dunk," according to Championship Director Neil "ShowMaster" Blaber". "The principle of providing the custom market with a focussed presence at one of the world's largest motorcycle expos was incredibly well received by the competitors who took part," Blaber said. "Since the 2014 event we have had time to gauge the level of wider industry reaction to the presence of the AMD World Championship grade bikes being seen in the context of INTERMOT and to take the pulse of the custom market about INTERMOT as a long-term host for the AMD World Championship. In both respects the response has been entirely positive. "There is no perfect hosting solution for any custom event, just as there is no perfect custom show; but throwing the focus onto attracting new customers has been exactly what the custom industry has said it needs, and the response in terms of entries for October this year, at this early stage, has been very encouraging. I can't recall ever having had so many at this early stage before." Show organizer Koelnmesse has responded to the 2014 success by now creating a dedicated 'Show-within-the-Show' concept for the custom motorcycle market, with 'INTERMOT Customized' slated to be stage in the 235,000 sq ft Hall 10 - one of the six halls of the state-of-the-art Koelnmesse complex in which INTERMOT will be staged this year. Located very close to three of the primary public entrances to the show, visitor analysis suggested that the AMD World Championship and its adjacent exhibitors saw some of the strongest attendee traffic of the entire show in 2014 - and with the marketing muscle of INTERMOT itself now in full flow behind the 'INTERMOT Customized' concept this year, this year is expected to see possibly the largest audience ever for any custom bike competition, anywhere.